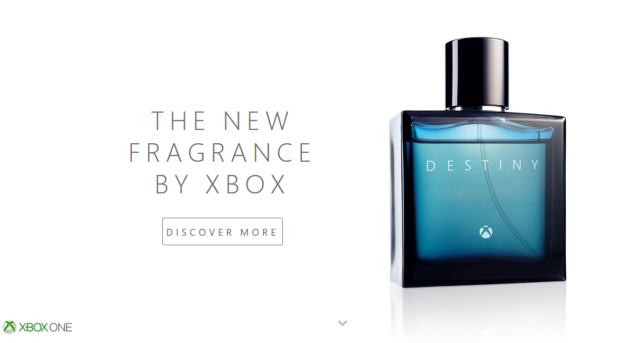 Microsoft Isn't Allowed to Advertise Destiny for Xbox - Mocks Sony with "Destiny Fragrance"
Bungie’s highly anticipated and most awaited online multiplayer first-person shooter video game is only a few days away from hitting the local markets, and it looks like the advertising war for pumping up the sale figures between two big console vendors is on. The fact is that Microsoft does not have “permission to run adverts” for Xbox versions of Destiny, nevertheless, the platform holder is still cleverly managing to spread out the word about Destiny Xbox One bundles, and mock Sony in a clammed up way, with a somewhat inventive website that is advertising Destiny Fragrance. In past weeks, you might have seen commercials and adverts for Destiny, which is an upcoming sci-fi always online multiplayer first person shooter video game title by Bungie that will land on multiple gaming platforms next week. You might have also noticed that these commercials mostly talk about PlayStation versions of the game, in fact, Destiny advertisements focus so much on PlayStation 4 and PlayStation 3 versions of the game that it almost gives an impression that the game is PlayStation-exclusive only, and Microsoft is not at all pleased with that concept. Sony is closely working with Activision on the marketing campaign of Destiny, and the good guys behind the game are offering almost all of the exclusive content to PlayStation owners first. Despite the game’s multiplatform nature, Microsoft is not allowed to run advertisements for Destiny on Xbox consoles, and it looks like the console manufacturer is finding no taste in this deal at all, so the company has come up a clever idea to advertise Destiny for Xbox consoles. Despite its close relationship with Sony on Destiny that is turning in the best favor of PlayStation owners in form of exclusive in-game content, Bungie has given its word that it loves Xbox and PlayStation fans equally. Looking at all this Destiny Fragrance thing, it appears that Microsoft is teasing (and trying to bypass) Sony about its exclusive rights to spread the word about Destiny for PlayStation. In case you have been living under a rock, Bungie’s blockbuster title, Destiny, will launch on September 9, 2014 for PlayStation 4, PlayStation 3, Xbox One and Xbox 360.